Over twenty years ago my husband's paternal grandmother passed away. The family was going through her possessions to divide up among various family members. 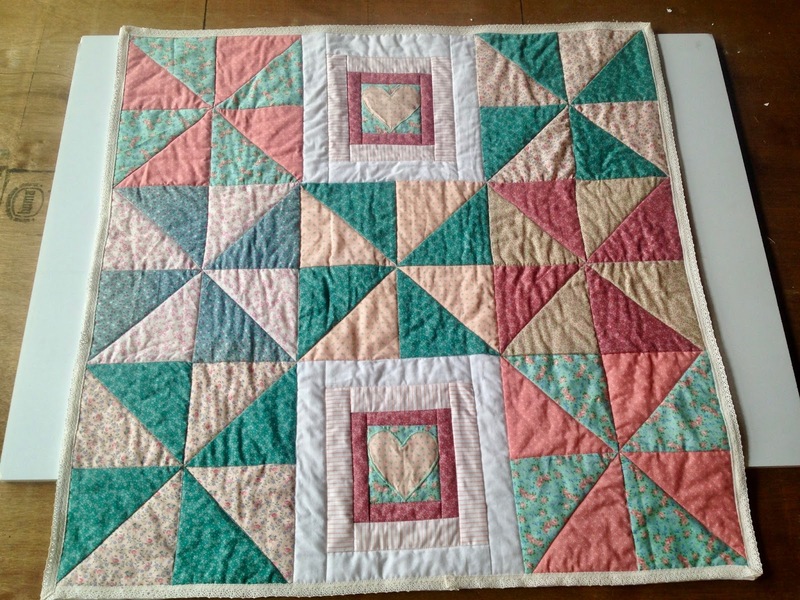 One of the items they discovered was a box of old quilt pieces; some cut into triangles, a couple embroidered hearts, fabric scraps, and one pinwheel block. My mother-in-law (knowing that I sewed) asked me if I wanted them. 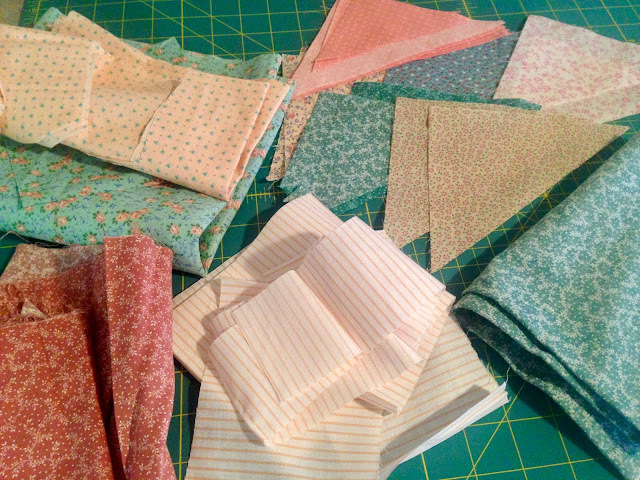 I thought the pastel, vintage-looking material was cute, so I said "yes" and I put them in a box hoping someday I would have time to finish "Grandma's Quilt". Fast forward twenty + years later and those quilt pieces were still sitting in a box. When I found out my daughter was pregnant with a little girl, I decided it was finally time to finish "Grandma's Quilt". 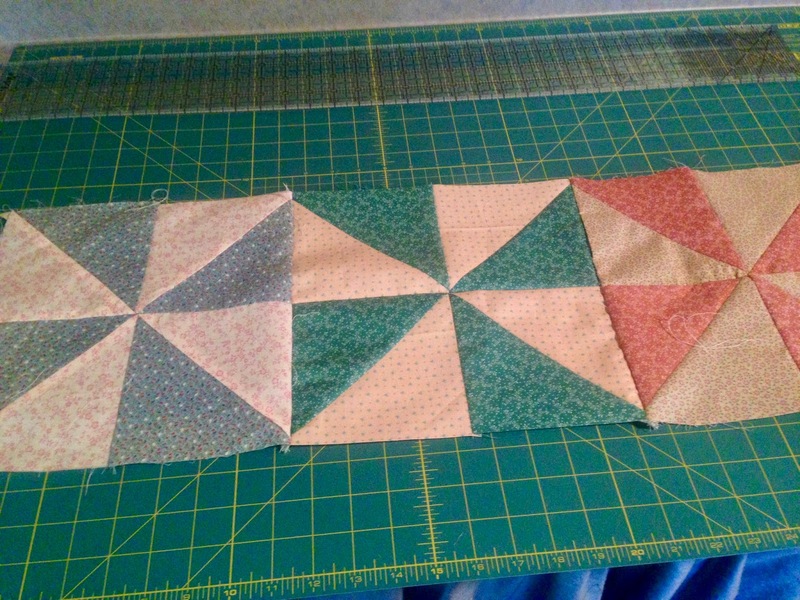 This is what was in the box: small scraps of fabric, and pre-cut triangles. 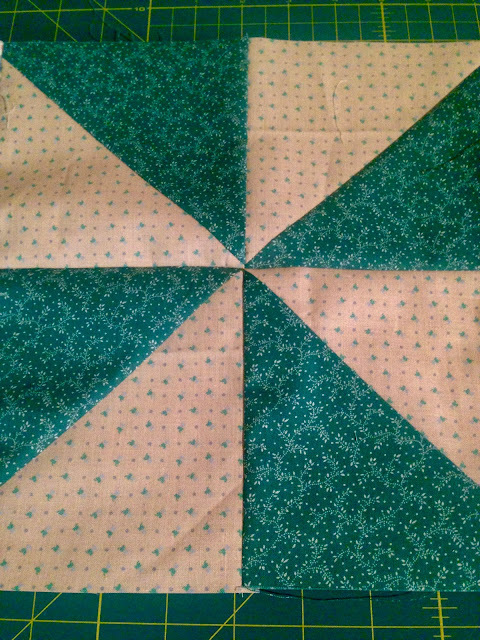 There was only one finished block and this was it. 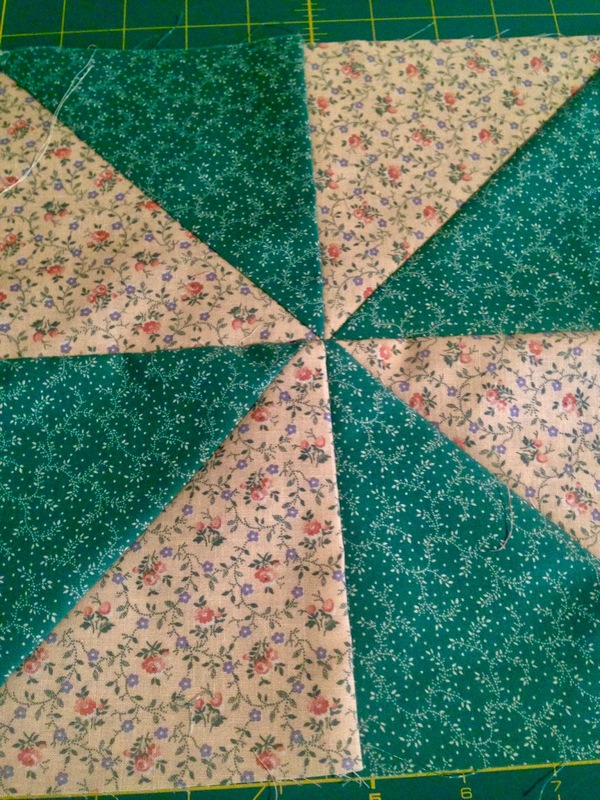 By looking at it, I knew she was trying to make a pinwheel quilt. 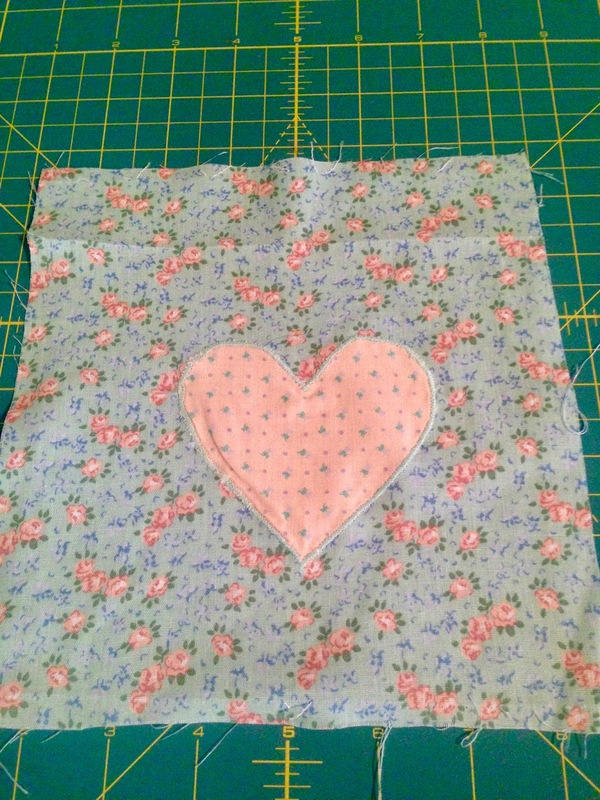 But I also found two embroidered heart panels. Hmm, what to do, what to do. 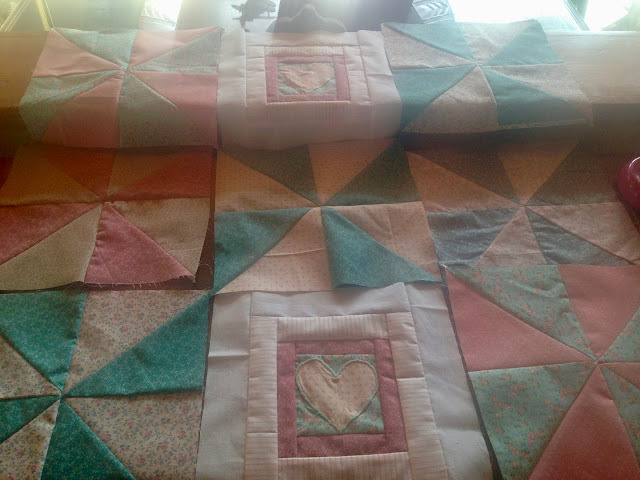 I had no idea what Grandma's original plan was as I only had pieces of fabric and one finished block. There were no quilt patterns in the box. So I came up with my own design. The original quilt block was extremely crooked, so I had to cut it down a lot. Then I made a quilt block using the other fabric scraps in the box, plus some of my own white fabric from my stash. I then made the rest of the pinwheel blocks using the pre-cut triangle pieces. 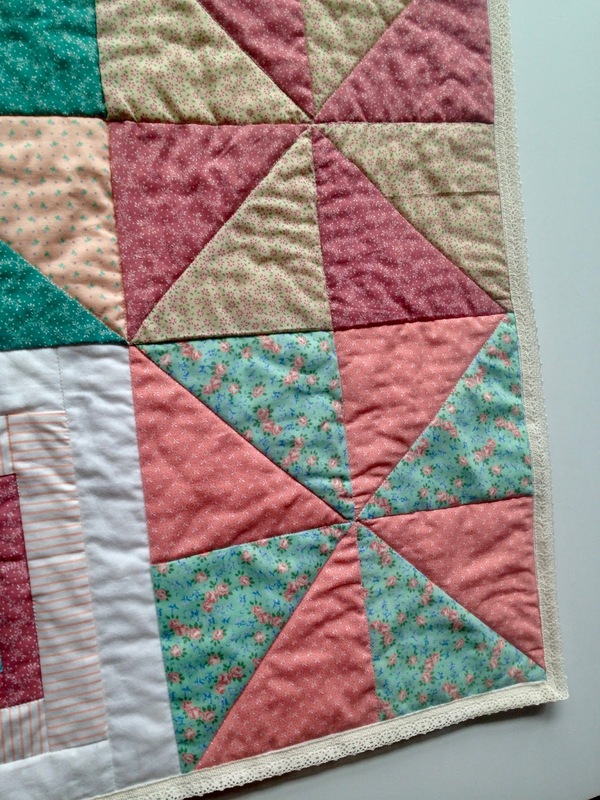 A pinwheel quilt is one of the easiest quilts to make. 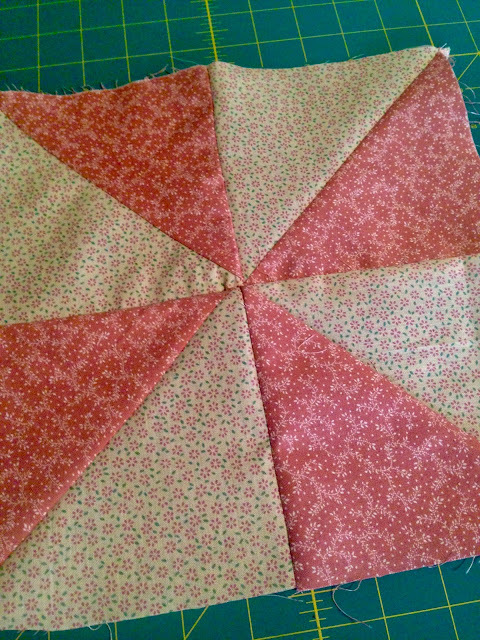 Although I was vaguely familiar with how to make one, I just googled "How to Make a Pinwheel Quilt" on the Internet to refresh my memory. There are loads of great videos out there. If I can make one, you can too! 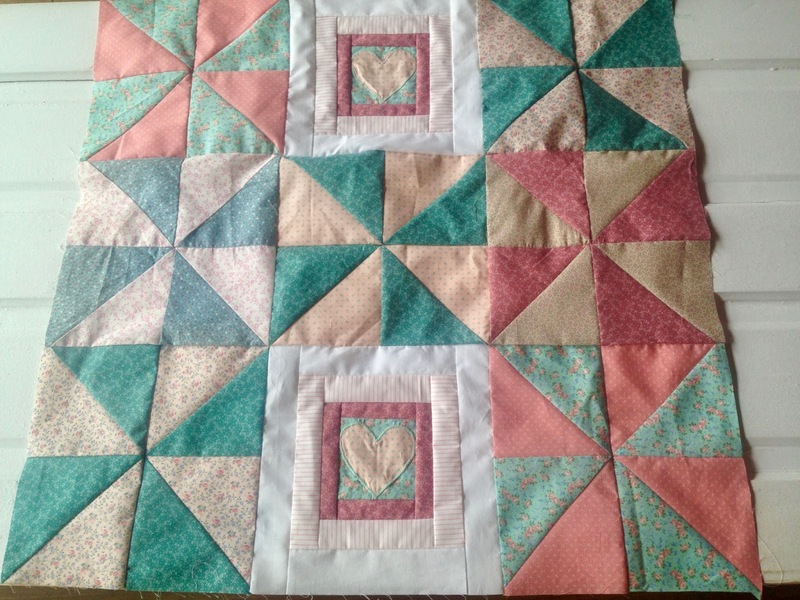 It was a coincidence that the colors of Grandma's Quilt pieces just happened to be the colors my daughter chose for her baby's layette: pink and teal. Or was it a coincidence? Sometimes I think these things happen for a reason and are not coincidences. After all the blocks were made, I laid them out in a pattern I liked. I did make a mistake that I would correct if I had to make the quilt all over again: I would have turned the bottom of the top heart block out so it was facing in the opposite direction. Unfortunately I didn't recognize my mistake till the whole quilt was done. Once I decided on my layout, I just started sewing the rows together. This is what the quilt looked like after all the pieces were sewing together before it was quilted. Using an old piece of pink polka dotted fabric from my stash (sorry, I forgot to photograph the back of the quilt and I already gave it to my daughter) and some quilt batting (also from my stash), I then began quilting the three pieces together. I did the "Stitch In A Ditch" technique to keep it simple. I then cut my own bias tape and finished off the edges. 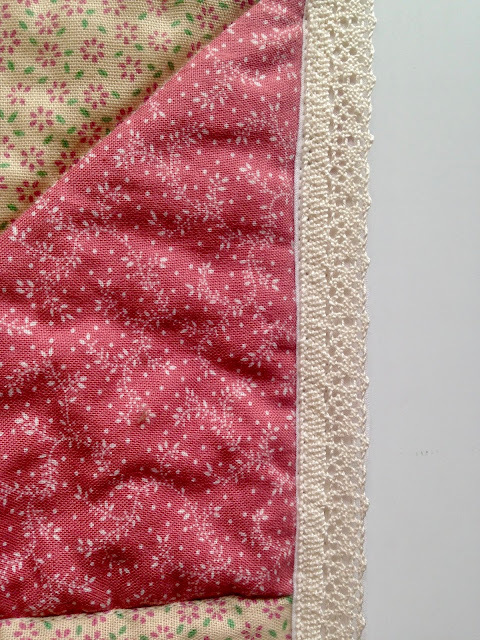 Because I was lazy and I didn't want to hand sew the bias tape on, I added a pretty lace trim from my stash to the edge of the quilt. 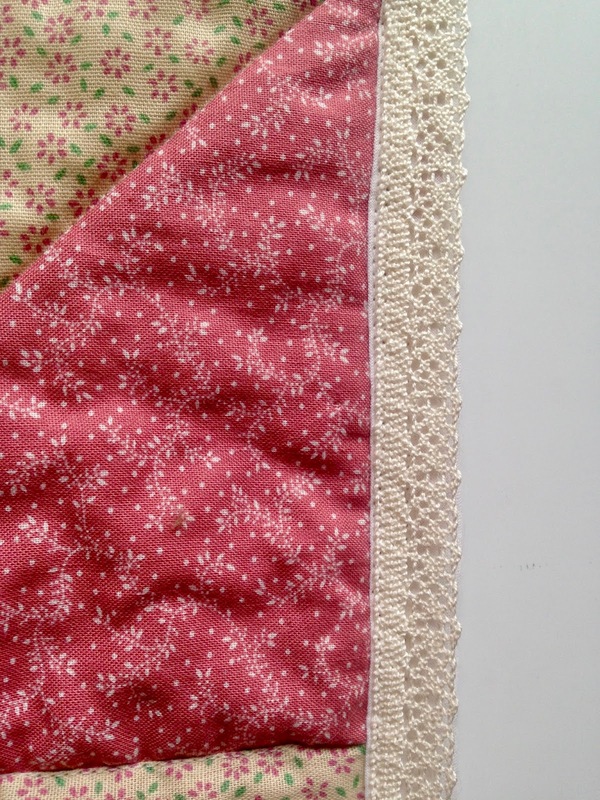 Here are a few close ups of the lace on the edge of the quilt. This quilt cost me nothing to make since I used items I already owned. I love that this quilt has so much history to it and that two grandmothers had a part in making this quilt. So much love and history has gone into it. This is a great DIY tips and sharing, thank you! Your quilt is lovely, beautiful. Oh my gosh, this is so gorgeous! I bet it took a lot of time to put together. 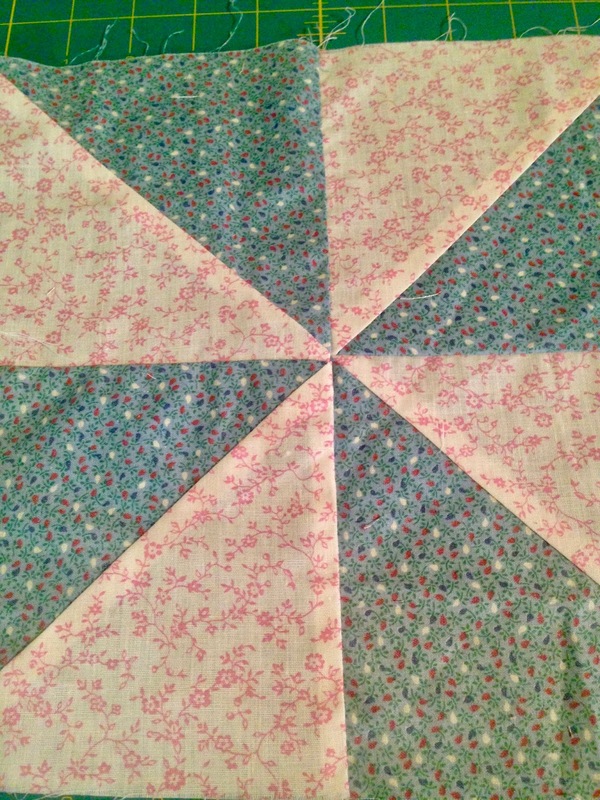 I have always wished I knew how to quilt! Thanks so much. It actually took very little time at all, especially in comparison to a queen or king size quilt. I think I had it done in a couple of weeks working only a few hours a day on it. 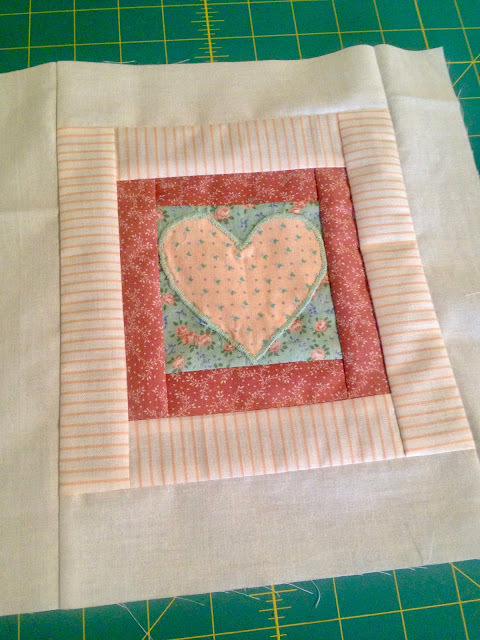 Such a lovely story for a beautiful quilt. Great work, it's so lovely. Your daughter must be thrilled with the heirloom and the care and love shared in making it. Thanks so much, yes Ashley and Jason loved it! What lovely meaning behind this quilt! It's something your daughter and granddaughter will cherish forever! I am sure this will be treasured forever, it's something to pass down to the next generations. What a meaningful gift! Thanks Elli! 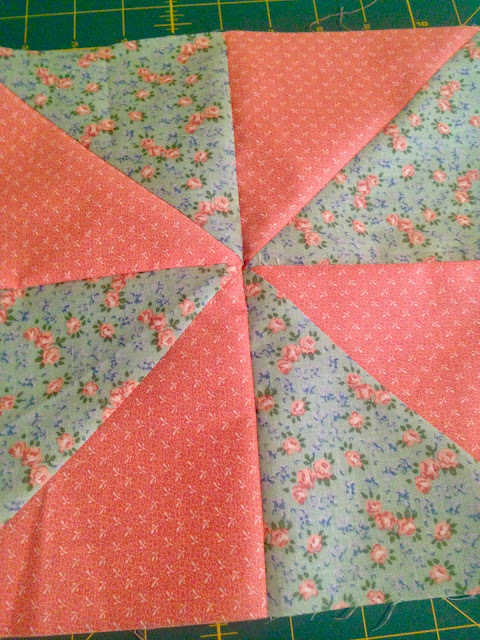 Quilting does take a lot of patience. I like designing them and making the top (the blocks), but I hate the finishing process. A lot of people pay someone else to finish them, but that is costly.